AC/DC cancels US tour dates as singer warns he faces "total hearing loss"
68-year-old Brian Johnson has been advised by doctors to stop touring immediately. AUSTRALIAN ROCKERS AC/DC have postponed the remaining dates on their US tour after singer Brian Johnson was warned he risked total deafness. The 68-year-old Johnson “has been advised by doctors to stop touring immediately or risk total hearing loss,” the band said in a statement. AC/DC, famous for playing at painfully high decibels, said it would play the 10 remaining US shows at later dates but “likely with a guest vocalist”. Johnson, known for his trademark cap and a voice that strains the vocal cords, joined the band in 1980 after singer Bon Scott died following a night of heavy drinking. The delayed shows include a concert due today in Atlanta as well as a 4 April show at Madison Square Garden in New York. It remained unclear whether the band would be able to pursue the European leg of their “Rock or Bust” tour that is scheduled to begin on 7 May in Lisbon. The tour had been due to end with a concert on 12 June at a 46,000-capacity park in Aarhus, Denmark. The rockers had added the additional dates after a busy 2015 that included a headliner appearance at Coachella in California, one of the world’s leading festivals. But Johnson’s hearing problems are just the latest of the band’s woes. AC/DC’s latest album “Rock or Bust,” released in 2014 after a six-year gap, is the first without founding member and rhythm guitarist Malcolm Young, who has retired due to dementia. 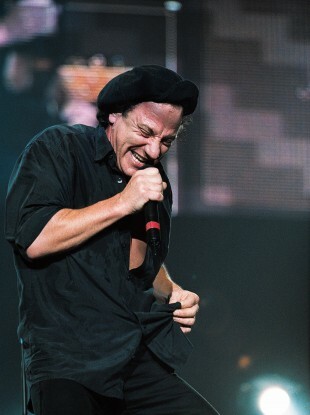 Young’s brother Angus remains the lead guitarist – known, even at age 60, for sporting his signature schoolboy outfit. The band has also parted ways with drummer Phil Rudd, who was convicted in New Zealand of threatening to kill an employee. AC/DC has sold more than 200 million albums since 1973 with “Back in Black” among music history’s top sellers. Email “AC/DC cancels US tour dates as singer warns he faces "total hearing loss"”. Feedback on “AC/DC cancels US tour dates as singer warns he faces "total hearing loss"”.